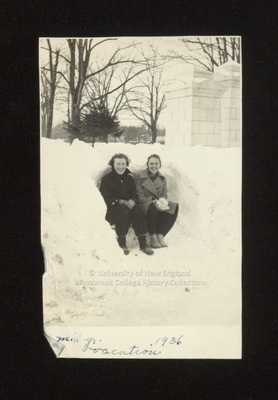 Two Westbrook Junior College students sit in a snow bank outside the Evergreen Cemetery gate in this 1936 sepia toned candid snapshot with "Mid yr. vacation, 1936" written on the front. On the back is written in blue ink: "Palmer & Cunningham, cemetery gate." The two young women wear coats and ski pants with boots and mittens.